From their resident cats to that old book smell, there's something about wandering up and down the aisles of a brick-and-mortar bookstore that online merchants could never replicate. In honor of Independent Bookstore Day (April 27, 2019), Mental Floss has picked the best bookshop in every state—plus a few others we loved, too. One of the Birmingham area's hidden gems, the Alabama Booksmith is a unique delight for book-lovers and collectors alike. Since a remodel in 2012, the shop has featured an inventory consisting exclusively of signed book copies. The store has another special touch, too: Every book is displayed face-out so that customers can more easily discern whether or not something is right for them. The cleverly named Title Wave Books is not only the largest bookstore in Alaska, but also one of the biggest used bookstores in the entire country. In addition to its massive catalog of over 500,000 books, the store houses many vinyl records, audiobooks, and DVDs. And if for some reason you aren't interested in checking out the books, the store also has a host of events including Scrabble and chess nights. With locations in both Phoenix and Tempe, Changing Hands Bookstore encompasses the best of Arizona literature. The Tempe location has been in business since 1974, and its success allowed them to open their second store in a repurposed restaurant in central Phoenix. The Phoenix location is home to the must-visit First Draft Book Bar—after all, how often you can be served booze at a bookstore? A community favorite located only a short distance away from the University of Arkansas campus, Dickson St. Bookshop features a plethora of literary classics and much more. With thousands of books onsite, it's frequently named not just one of the best bookstores in Arkansas, but also one of the best in the nation. Owners Donald Choffel and Charles O'Donnell have been in charge from the very beginning in 1978. Denver’s storied Tattered Cover has been around since 1971 and has been through numerous transformations: moving locations, opening satellites, adding cafes and, at one point, having a (since closed) restaurant and bar. Considered one of the most successful independent bookstores in the country, it now sells new and used books at four different outposts in Denver and Littleton, Colorado as well as operating several stores at the Denver International Airport. You can find international bestsellers alongside indie literature and a wide range of used volumes. It hosts writing workshops, book clubs, literary readings, film screenings, and storytime for kids, and in 2019, launched the one-day Colorado Book and Arts Festival. R.J. Julia has been one of Connecticut's premier book destinations for decades, and for good reason. Named one of New England magazine’s "Best Bookstores to Spend the Day" in 2018, the Madison-based bookstore features a large selection of books and gifts, knowledgeable staff, and a great cafe. It's more than just a place to stop by and grab a new paperback, though. The store hosts more than 300 events every year, and owner Roxanne J. Coady is dedicated to finding every reader their perfect book. In 2009, she launched Just the Right Book, a personalized book-of-the-month subscription service, and recently expanded it to include a Just the Right Book podcast that features interviews between Coady and bestselling authors. If you can't stop by the store in person, we recommend using R.J. Julia's "What's Your Perfect Next Read" online quiz to find your new favorite book. Founded in 1975, Browseabout Books in Rehoboth Beach, Delaware is a local legend—so much so that the company's 40th anniversary party was attended by Delaware's governor and multiple state senators. In 1992, Browseabout took over a former open-air mall that once housed seven stores and evolved to sell gifts, toys, and stationery alongside books and a coffee bar. Poets.org lists it as one of its favorite poetry-friendly bookstores, while writer Anna March extolled its virtues in the literary journal Tin House in 2013, calling it "a thing to behold—best sellers and beach books, yes, but also a strong kids section; travel books and literary fiction with an extensive back catalog; books by local authors; and a selection of essays, poetry, plays." There are several locations of Books & Books, which has stores around South Florida (and one in the Cayman Islands), but the Key West affiliate of the chain has a special place in book lovers' hearts for one reason: It's the only store that was founded by Judy Blume and her husband, George Cooper. Located in a former Masonic Temple that now serves as a nonprofit arts space, it's just what you would expect from a bookstore owned by a literary luminary. The store is designed with readers in mind, with reading lights and a curated selection of literary fiction, poetry, art books, magazines, and new bestsellers, plus an entire room devoted to professional-grade art supplies. Oh, and it's perhaps the only bookstore where you can get book recommendations straight from the mouth of Judy Blume. Charis Books And More has been an Atlanta institution since 1974, making it the oldest independent feminist bookstore in the southern United States. Charis's inventory is stocked with books that fall into diverse categories, like LGBTQ fiction and non-fiction, food issues and body image, anti-ableism, race, and reproductive rights. As part of its mission to support local, independent authors, Charis encourages writers of all backgrounds to request to have their books sold in the store. The shop also hosts about 270 literary, social justice, and educational events a year. The westernmost bookstore in the United States, Talk Story Bookstore has over 150,000 new, used, and out-of-print titles to choose from, whether it's mysteries or Hawaiiana. As the only bookstore on Kauai, it's a much-loved community resource, and patrons praise its friendly owners, Ed Justus and Cynthia Lynn, who have been in business since 2004. As you're browsing the books and records, keep an eye out for the store's cat/guardian angel, Celeste. Founded in 2006, Rediscovered Books is known as the go-to community bookstore for literature geeks. With more than 30 book clubs (including a Comic Book Book Club, a Macchiato and Murder one, and a noon-hour Lit for Lunch group) and a litany of special events ranging from author signings to their so-called "infamous" Book & Booze nights, there's sure to be a reading group to meet any adult special interest. And for the kids, there's a weekly Tasty Tales storytime with snacks from the local Guru Donuts. A beloved part of the Naperville, Illinois, community since 1875, Anderson's Bookshop is still operated by fifth-generation descendants of the original founders. It's a hub for author events, book clubs, children's reading activities, and a huge selection of books. Catch the monthly staff picks of new and older titles offered at a 25 percent discount. Recent selection included Meghan Cox Gurdon's The Enchanted Hour: The Miraculous Power of Reading Aloud in the Age of Distraction and Brad Meltzer's The First Conspiracy: The Secret Plot to Kill George Washington. Hyde Brothers claims to be "Indiana's best-loved bookstore," and who are we to argue? This charming secondhand bookshop brims with titles jostling for space on floor-to-ceiling shelves. There are plenty of step stools and rolling ladders to help you find what you crave among the store's specialties—history, literature, nature, sports, horror, religion, and more. And while you're there, don't forget to pet Scout and Sherlock, the bookshop's two kitties. Spoiler alert: This secondhand bookshop isn't actually haunted (it's named after the Christopher Morley novel of the same name). While that may be disappointing, this 41-year-old shop's inventory definitely isn't. Spread over 10 rooms in an 1847 mansion, the collection spans fiction, world cultures and history, art and writing, regional history, science and nature, and much more. The store's feline employees Nierme and Logan keep an eye on it all. The first stop for authors and their fans in Kansas City is usually Rainy Day Books. The shop was one of the first in the U.S. to focus on author events to create a community around books and reading, and today, it has one of the busiest schedules in the country. That's in addition to a selection of books featuring emerging writers as well as bestsellers. Recent staff picks included Therese Anne Fowler's A Well-Behaved Woman: A Novel of the Vanderbilts and Maxwell King's The Good Neighbor: The Life and Work of Fred Rogers. One reviewer called Joseph-Beth Booksellers in Lexington the "world's largest small bookstore" and that's a pretty apt description for this literary treasure trove. CEO Adam Miller says the store carries "more titles than any of the national bookstore chains in the country." JB, as it's called locally, has six outlets in both Kentucky and Ohio, but the Lexington branch is perhaps the most beautiful one. Grab a book and a bite to eat from the store's Brontë Bistro, and enjoy the atmosphere as natural light filters into the building through a skylight in the high, vaulted ceiling. It's only fitting that As I Lay Dying author William Faulkner's former apartment in New Orleans was converted into a bookstore. Located on Pirate's Alley in the historic French Quarter, Faulkner House Books is just as charming as you'd expect. Naturally, you'll find a number of Faulkner titles on the store's wooden shelves, but the outlet also specializes in Modern First Editions, Southern Americana books, and the works of Tennessee Williams and Walker Percy. Portland has been called the "hippest city" in Maine, so it's perhaps no surprise that the coastal town is home to roughly a half-dozen indie bookstores. If you only have time to visit one, though, make it Longfellow Books. Named after Portland native Henry Wadsworth Longfellow, the store hosts regular book launches, poetry readings, and book clubs (including one that focuses on international mystery books). Ideal for browsing, Longfellow hosts a variety of odd and unusual titles. With so many colleges in the state, it makes sense that Massachusetts also has an impressive array of bookstores to cater to all those students. Trident Booksellers & Cafe not only has great books, but something that's just as essential to college kids: A cafe that serves breakfast until midnight. After grabbing a meal or coffee, guests can browse the books and one of the most impressive magazine selections in the city. Book lovers could easily spend all day at John K. King Used and Rare Books in Detroit. The store houses more than a million books spread over four stories, with 25,000 volumes in the rare books room alone. Don't let the intimidating size stop you from popping in: Staff members hand out maps to guests as soon as they enter. Though the inventory here might be geared toward younger readers, it would be hard for any true book lover to pass up a visit to this charming shop that takes its name from Where the Wild Things Are. Opened in 1992, Wild Rumpus endeavors to be more than just a bookstore—it hopes to turn curious kids into lifelong readers. The store has teamed up with the Autism Society of Minnesota to host a biweekly story time for sensory-sensitive youngsters, which takes place before the store opens to the public. While the store itself is more laid-back than "wild," it is home to a menagerie of pets—including birds, a trio of rats named for A Wrinkle In Time characters, a mischievous ferret named Ferdinand, and a couple of chinchillas named Caldecott and Newbery. It's hardly surprising that the store was named Publishers Weekly's Bookstore of the Year in 2017 (or that it was the first children's store to ever achieve that honor). "Three bookstores 100 feet apart" boasts Oxford's Square Books. All located at the historic town square, the main bookstore holds court in an older building with a block-long second-level balcony. They also have a separate children's bookstore and "Off Square Books," a full store for lifestyle books (cooking, travel, photography, etc.) and bargain buys. Along with the usual author events, Square hosts Thacker Mountain Radio, a live weekly show that features both literary and musical talent—it's no wonder Publishers Weekly named Square Books their Bookstore of the Year in 2013. Founded in 1969 by a group of Washington University grad students who wanted a central place with a wide variety of literature, St. Louis's Left Bank Books is now celebrating its 50th anniversary this year. Left Bank has grown into cultural institution—it's become a center for community outreach, it has a foundation for helping improve literacy in the St. Louis public schools, and it hosts multiple open book clubs each month, including a gay men's group, a lesbian group, a "read the resistance" night, and a book group dedicated to horror novels. Established way back in 1957, the Country Bookshelf has an old-timey feel and knowledgable staff that frequently earn it accolades. In addition to author events and a bookclub, the store partners with Bozeman schools and the Bozeman Public Library to help promote literacy with a program known as "One Book—One Bozeman." Functioning as both a bookstore and a coffee shop, Indigo Bridge is a great hangout spot for any kind of reader. The store has a particularly strong connection to the local community, with some of its spaces designed by children. Furthermore, all of the coffee sales are donated back to the community. Does anyone get a lot of reading done in the same state as Las Vegas? Apparently so: Sundance has been in business since 1985 and in its current location for the past eight years. Their selection is housed in a converted Victorian mansion that's become a monument to the written word. It's also minutes from the airport so you can pick up titles for your travels. If you need a little more incentive to log off Amazon and go into a physical bookstore, Gibson’s in Concord makes a compelling case. In business since 1898, the store not only houses books and baristas but also acquired local toy store Imagination Village to incorporate educational toys and games. Fans have mused—semi-seriously—that being locked in the Montclair Book Center for the rest of your life wouldn't be so bad. The shop boasts over 10,000 square feet of shelves stocked to the brim with new and used titles. Relax with a book and organic, locally roasted coffee indoors or on the patio at Collected Works in Santa Fe, which boasts over 30,000 titles and plenty of author readings. Fans of the bookshop point to its relaxed, inviting atmosphere and fresh desserts as reasons to linger. The Strand's multi-story collection of books is so plentiful it bleeds out into the sidewalk. 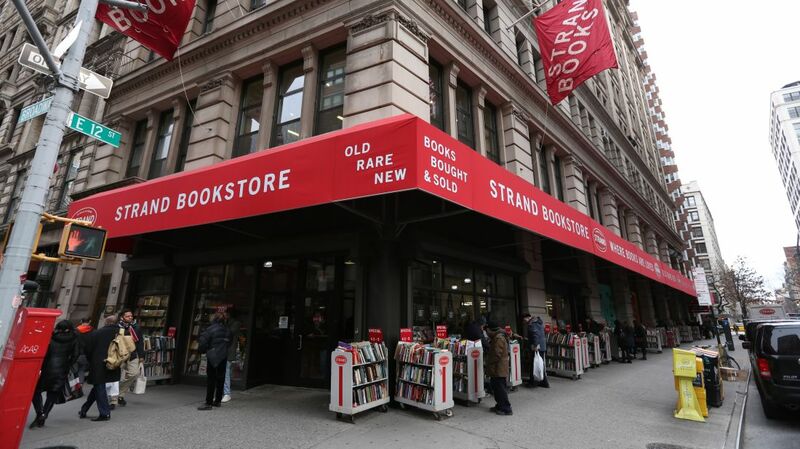 The store claims its bookshelves hold 18 miles' worth of new, used, and rare books. There's stiff competition in North Carolina, but Main Street Books in Davidson is one of the finest literary establishments in the state. In business since 1987, the store was actually built out of an old general store, and offers a plethora of programs and activities for book lovers. As part of the bookstore's subscription program, "The Matchbox," customers can elect to receive a staff-approved book from the store's kids' books, first editions, or paperback titles each month. In May 1989, brothers Jeff and Greg Danz realized their longtime dream of opening the kind of store where they would want to shop, launching the first location of Zandbroz Variety in Sioux Falls, South Dakota. It became so popular that they decided to head north to open a second location in Fargo just a few years later. The Fargo store features a trippy mix of smart and quirky goodies, but books are undoubtedly the main event, with a special section dedicated to local authors and titles that explore the history of the area (which is just as interesting to visitors as it is longtime residents). But there’s also a full supply of greeting cards, toys, jewelry, housewares, and other trinkets. They also brew a mean cup of coffee, giving you one more excuse to never want to leave the store’s delightfully eclectic confines. Loganberry Books—named after owner Harriet Logan—has been offering Clevelanders an alternative to big bookstore chains since 1994. Considering that Loganberry boasts over 100,000 new, used, and rare titles, the shop certainly gives mainstream outlets a run for their money. (Another perk is the store's resident cat, Otis.) Online, Loganberry Books also runs helpful service called "Stump the Bookseller," which lets customers describe books they can't quite recall the title of, in hopes that other bibliophiles will be able to fill in the gaps. This little used bookstore and bric-a-brac shop in Stillwater covers pretty much any genre you might want—get lost in the sci-fi and horror nook, or search through shelves on the presidents, gardening, or local history and authors. Its unusual name reveals its owner's varied interests: Founder Susan Thomas, a retired analyst with the U.S. Forest Service, spent years studying gypsy moths. She also has always loved the Lewis Carroll poem "The Hunting of the Snark." Combine the two, and you get GypsySnark. For nearly 40 years, Bloomsbury Books has worked to make the pleasure of reading as pure as possible. It's named for an early 20th century London literary society called the Bloomsbury Group—one in which Virginia Woolf was a central figure, just as she is at this Bloomsbury. Ask the staff for recommendation, then relax with your new tome in their cozy on-site coffeeshop. Whether you know it or not, there’s one thing that can turn any bookshop from good to great: a resident cat. At Farley’s, that would be Butter—an adorably attentive feline who serves as both greeter, security, and insurance that you'll make a repeat visit. Located in bustling downtown New Hope, a picturesque enclave nestled on the Delaware River, Farley's has been in business since 1967. The shop has that lived-in feel that makes you kind of nostalgic for the time before Amazon existed, and its friendly staff is full of bibliophiles who seem magically able to figure out what it is you're looking for even if the only description you can utter is "a true crime book with a black cover by that guy." It's also worth noting that the store has a private parking lot, which is a rarity in the area and a godsend for shoppers who have a tendency to lose all track of time when surrounded by an impossibly well-curated collection of literature. Cellar Stories prides itself on being "the largest used and rare bookstore in the smallest state in the U.S." The shop has graduated from the basement location that inspired its name to a Providence store big enough to house over 70,000 volumes. It's a great place to find books related to Rhode Island and New England history, as well as obscure science fiction novels, cookbooks, vintage paperbacks, and more. Don't let the small(ish) storefront fool you: Blue Bicycle Books on Charleston's Upper King Street, located just a few blocks from the College of Charleston, takes up a substantial amount of real estate: It goes back 172 feet. It has ample space for as many as 150 people to attend the more than 200 author events the store hosts each year. David Sedaris, R.L. Stine, Sue Monk Kidd, Bill Murray, and Neil Gaiman are just a few of the hundreds of authors who have stopped by since Blue Bicycle opened in 1995. The shop devotes a chunk of its shelf space to local Charleston authors as well as military history (The Citadel and Fort Sumter are just a stone's throw away, after all), but it doesn't shy away from bestsellers and other new titles. The shop also deals in rare signed first editions from the likes of Harper Lee and William Faulkner. In an effort to engage its community of young readers and writers, the store also hosts a summer writing camp for kids and the annual YALLFest, which attracts more than 12,000 YA fans (not to mention top authors in the genre) to the city each November. For more than a decade, Mitzi's has been offering Rapid City's literati an amazingly well-curated selection of books in a comfy-cozy shop that kind of feels like an extension of your own living room. You'll get no dirty looks here if you decide to plop down in a chair and while away an afternoon reading one of the knowledgeable staff's latest book recommendations. In fact, hanging around is encouraged. Best of all, there's just as much variety in the well-stocked children's book section, making a visit to Mitzi's an easy all-ages affair. Parnassus Books ("An Independent Bookstore For Independent People") has become an oasis for Nashville book lovers. Indeed, it was designed that way: Bestselling author Ann Patchett and publishing veteran Karen Hayes opened Parnassus in 2011 at a moment when Nashville had zero other bookstores, drawing on Patchett's childhood love of smaller-scale, personable bookshops. "I wanted to re-create that kind of bookstore, one that valued books and readers above muffins and adorable plastic watering cans," she writes on the Parnassus website. Highlights include books by local authors, a standout biography section, a passionate staff, regular author events (including a Saturday story time), and a "Conscious Aging" book club. The city of Austin, Texas, has gone through rapid changes in the last 10 years. While restaurants have gotten more expensive and buildings have gotten taller, some staples of the city remain. The charm of "old" Austin can still be found at BookPeople, a local favorite since 1970. Every bookseller there is extremely well informed, they're never out of stock of the classics, and they are always promoting new, great literature. Some of the biggest authors in recent memory have made their way through for readings and events. It's been the best bookstore in Austin since they opened their doors, and it's always worth stopping by. Ann Berman and Betsy Burton wanted a place to work on their novels when they opened King’s English in 1977. They ended up committing themselves fully to the business, and today, King's English is one of the most beloved bookshops in Utah. Though it has attracted some famous fans, like author James Patterson (who gave the store a grant to build its children's section), it's still a community business where employees remember your name and your reading preferences. This warm, family-owned bookstore has been around since 1976, although it moved across the street to take over the beautiful premises of a historic inn. With a great selection, plenty of reading nooks, and a dedicated staff (some of whom have been there for decades), you're sure to find your next favorite read. Close to a third of the shop is dedicated to kids' books, which makes it a perfect excursion for little ones. There's food, too, at the Spiral Press Café, in case customers get peckish. According to its website, Chop Suey Books has its name because its original location was on the former site of George's Chop Suey, whose rusted sign remained on the wall even after the eatery had gone. But the term chop suey, which roughly translates to "a little bit of this, a little bit of that," also symbolizes the store's eclectic approach, which ranges across subject matter and material. Today the shop is home to two floors of books, both used and new, as well as a very sweet black-and-white cat known to lounge in the shop windows. A community mainstay since 1973 (even if some still mourn the original, historic Pioneer Square location), Elliott Bay Books is the place to find the latest books from established names and rising stars alike. New releases (as well as some older gems) are prominently displayed with hand-written notes from the sales staff, and the local history section is particularly strong. A downstairs area is one of the best places in town to catch local and touring authors, and the cafe is a perfect spot to refresh or even work on a laptop (provided you can find a seat). For serious bibliophiles, it's a must-see destination in the Pacific Northwest. It would be easy to lose track of time and accidentally spend an entire day at Taylor Books, Charleston's one-stop shop for all things artsy. Sure, the brick-walled building is charming, and there are thousands of books to choose from, but those aren't the only draws. Customers can also grab a coffee and scone (lovingly made by owner Ann Saville) from the built-in cafe, take a pottery class, stroll through an art gallery, and attend live musical performances on the weekends. This independent, woman-owned bookstore works hard to curate its selection to focus on women, authors of color, and smaller publishing presses. One of the ways Dotters stands behind their selections? Every book is forward-facing, meaning no books can be hidden away in the corner of a shelf. And if you can't make it into the beautiful little shop, its monthly subscription service will mail that month's book club pick in addition to a new recommendation list and a locally designed bookmark. This bright, cozy little enclave in downtown Rock Springs has everything you need for a relaxing evening in, with or without your favorite bibliophile friends. Find a book on their floor-to-ceiling wall of titles, tuck into one of many white couches that wind through the shop, and order some wine and charcuterie. Sidekicks has partnered with Jackson Hole Winery, so the selection of local wines is as well-stocked as the bestsellers up front. By Colin Ainsworth, Erika Berlin, Michele Debczak, Shaunacy Ferro, Kat Long, Bess Lovejoy, Emily Petsko, Javier Reyes, Jake Rossen, and Jenn Wood.